Macau, a growing casino hub, is only an hour-long ferry ride from Hong Kong. 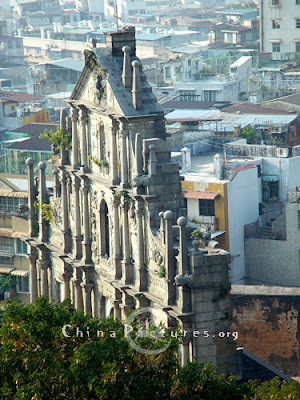 It’s a former Portuguese colony, and the ruins of St. Paul’s are worth visiting. I, however, took the casino route. Reminiscent to Las Vegas, there are multiple resorts and casinos in the area such as the Venetian, Wynn, and MGM. We took a bus from the ferry port to the Venetian and walked around. The hotel had a lot of open unused space, and it was quite different from Las Vegas. Still, the casino has the usual slot machines and table games. I tried the Michael Jackson slot machine and lost HKD300. Luckily, that’s close to USD30 so it wasn’t a big loss. I followed up my gambling with a beer at the Irish pub just off the casino floor. I’ll have to go back to Macau in some other life. It wasn’t all I had hoped for but then again, I didn’t put in the effort to search the city for whatever it was I was looking for. In my dreams, it’s a place of extravagant gaming, drinking, and dining. And that very well could be the case, but the Venetian just wasn’t where it was at! I do encourage you to experience Macau if you find yourself in Hong Kong for an extended period of time. Report back to me with your experience and recommendations. Happy gambling and good luck!